The Roman summer has arrived, and the forecast the next days says 30C, 34C, 34C. The fruit and veg shop has fragrant melons, watermelons and lots of cherries, and large extravagant bell peppers. 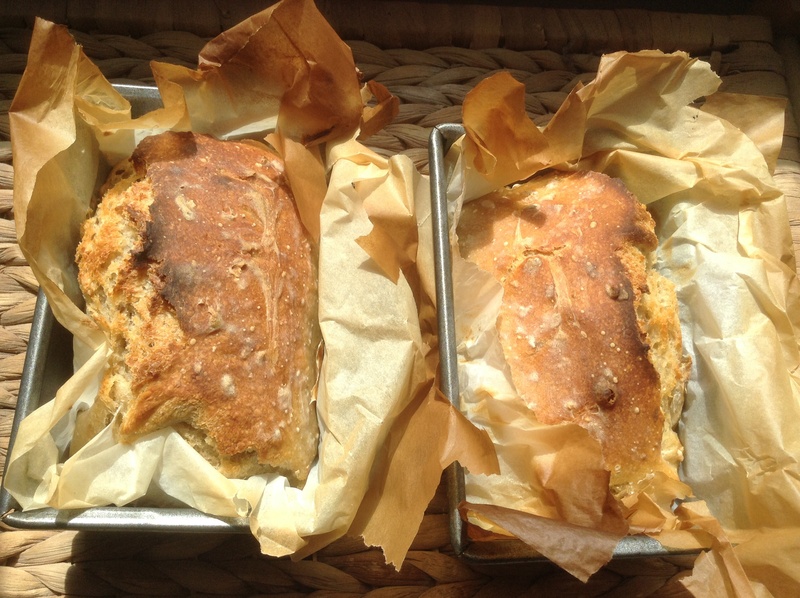 Time for iced tea, salads and minimal cooking….. And here I am, baking bread? Actually, mid evening we still get a lovely cool breeze here, so we fling all the windows open and air out the flat, listening to conversations across the courtyard, while observing neighbours in undershirts, watering their balcony plants. Stir the sourdough starter with the water. Add the flours and mix well. Cover with plastic wrap and let rest for 20 minutes. After this initial rest, add the salt. Mix well. Add more flour or water if you think the dough needs it. Cover the bowl and let rise for about a couple hours at room temperature. Fold the dough a few times (just in the bowl, using a spoon or spatula). 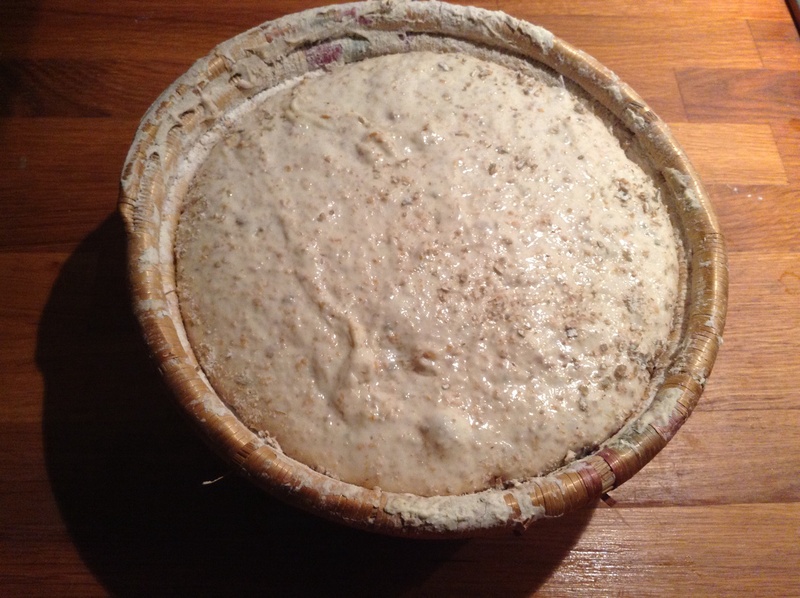 You will feel the dough becoming more elastic and responsive, and it will increase nicely in volume. For baking same day: move the dough to a floured banneton and cover it with plastic (a hotel shower cap works well), and let it rise 5-6 hours at room temperature. Slash and bake. OR: If you are in Rome, it is June and your kitchen is never cooler than 25C, leaving the dough to rise 20-24 hours in the fridge might work better. When ready to bake: heat your oven to 250C, with a cast iron pot. When it is properly hot (or after at least 20 minutes), take the pot out carefully. 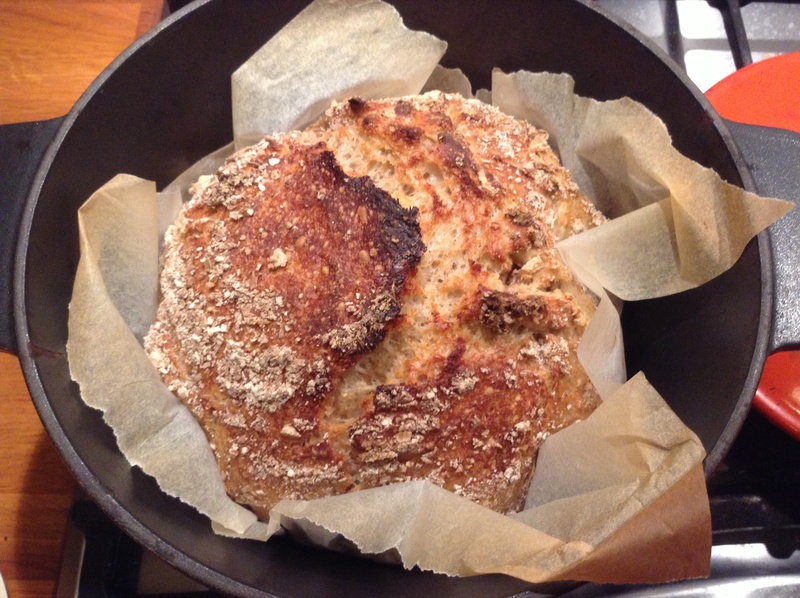 Invert the dough onto a piece of baking paper, slash the dough, and put the bread in the pot. Bake at 240-250C for thirty minutes with the lid on, then 10-15 minutes more with the lid off, until the bread looks done and the base of the bread sounds hollow if you tap it. About 45 minutes in all, depending on your oven. Cool before slicing. Note: at some point I will give in and use the bread machine, which makes OK bread without overheating the flat. 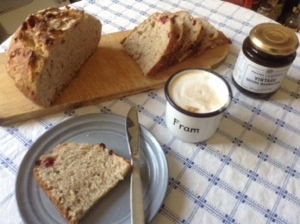 But a nice crusty sourdough loaf is still more enjoyable. We were looking forward to the Festa della Cultura here in Garbatella this weekend, but it is cancelled this year. Just a parade of protest on Saturday, which we will watch from the balcony. 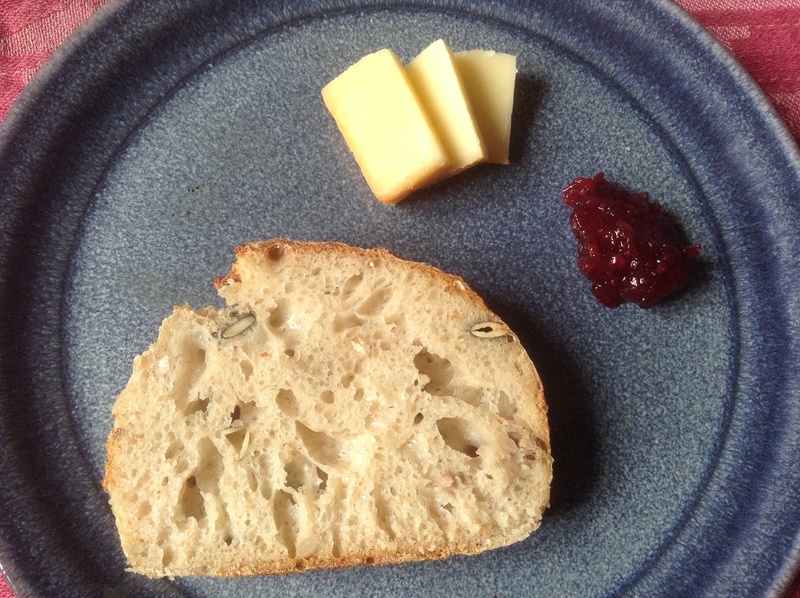 This entry was posted in baking, food and tagged bread, overnight, sourdough on June 11, 2014 by krumkaker. It is summer, time for iced drinks and G&Ts, but ice cubes are hard to accumulate, as my freezer is full of mysterious icy packages and boxes. It is not the chest freezer of a good Norwegian kitchen, with elg and self-fished mackerel in it, but I do hoard my Norwegian berries, salmon and extra brunost (sweet brown goat cheese). But no, it is time to excavate the freezer, make lots of ice and actually use some of my treasured stash of tyttebær, or lingonberries. Normally I would crush them to make fresh jam to have them with meatballs, or other meat, but they are also nice in bread. Before last rise: a handful of frozen tyttebær, or frozen cranberries. Stir the sourdough starter with the water, My starter is made with coarse rye flour, which adds more texture and flavour, but use what you prefer. 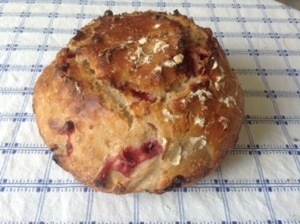 Add the flour, oatmeal and jam and mix well. Note: The jam is optional, it vanishes into the dough but goes nicely with the rye starter element, while giving moisture. It is not very sweet. If you do not have old lingonberry jam from IKEA languishing in your fridge, that is absolutely fine, just add a little more water. Cover with plastic wrap and let rest for 20 minutes. After this initial rest, add the salt. Mix well. Add more flour or water if you think the dough needs it. Notes: Very nice with butter! I have made this in loaf tins as well, works just fine. The berries are tart but not sweet. You could replace these with frozen berries, or dried cranberries soaked in water, but that would be a sweeter taste. 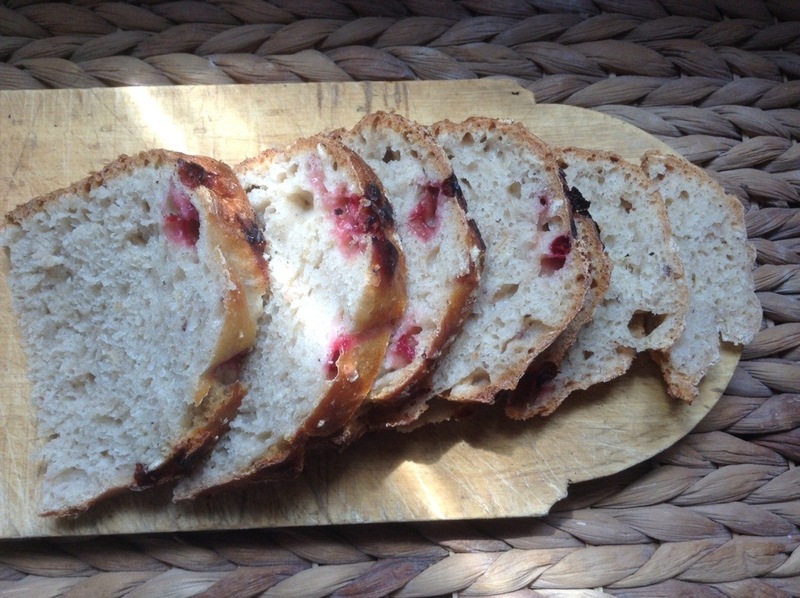 This is not a sweet loaf, just a sourdough loaf with little bursts of tangy flavour. Now, where is my G&T…..? 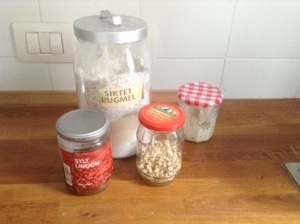 This entry was posted in baking, food and tagged bread, overnight, sourdough, tyttebær on May 31, 2014 by krumkaker. Being a weekend baker, I usually feed my starter Thursday or Friday, and bake Saturday. This week was unexpectedly busy, what with a three-hour condominio assembly Friday night. The owners of flats and shops in our small building meet to discuss bills and repairs to the common areas, with plenty of side discussions, smoking breaks and gossip. Still, no lengthy shouting episodes this time, so not too bad. Still, it mean that by Saturday afternoon I was very behind schedule. So I fed my sourdough starter, left it for three hours, made up the dough, and hoped for the best. Would we have decent bread for a late Sunday breakfast? Ideally this should be mature sourdough starter, but I gave mine three hours and made up the dough. Normally I’d use a coarse rye flour, but this time I used a lighter rye flour. Add flour, water, and seeds, and stir together. After half an hour or so, add salt and fold dough. Leave for 2-3 hours on the counter, folding a few times along the way. Note: This dough is meant to be baked in a cast-iron pot (250C, 30 min with lid, 15 min without). For a change, I divided the dough into two smaller loaf pans instead, each with baking parchment, covered each with a plastic shower cap, and left it overnight in the fridge. The next morning, take the loaf tins our of the fridge and heat the oven to 250C. Slash tops. Bake 35 minutes or so at 250 until nicely golden and hollow when tapped underneath. Cool before slicing. Notes: As you see, the structure was good, with more air pockets than usual. I wondered if they needed a lid, as the dough looked a but flat and unpromising, but the loaves rose well. 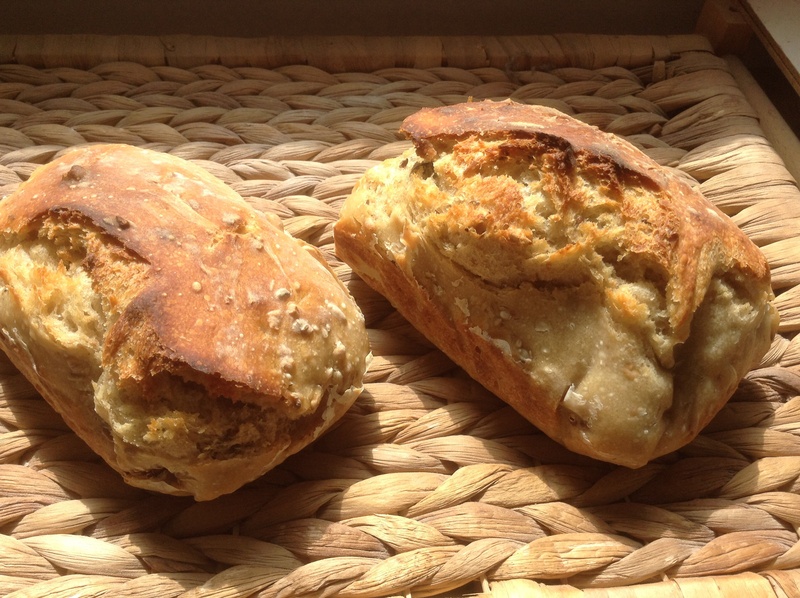 These are lighter loaves, less coarse than I usually make and with a different starter content. 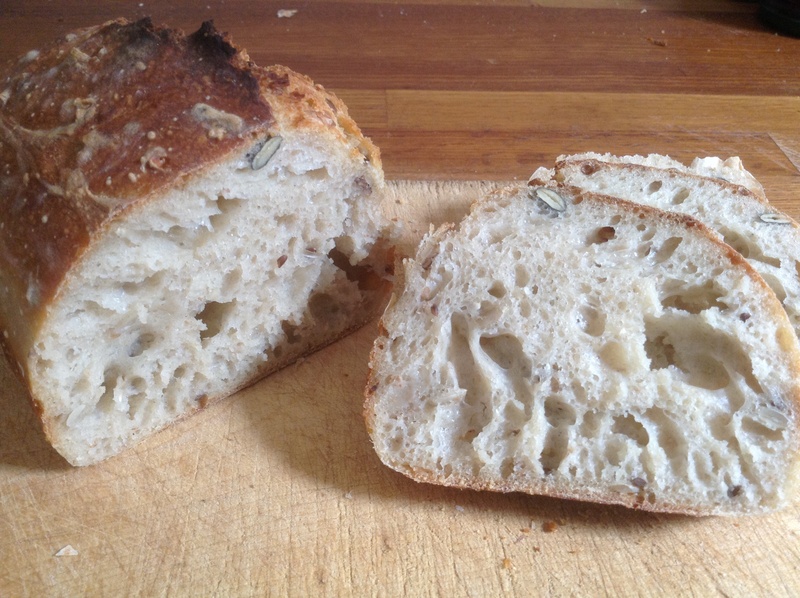 The crumb seemed a little damp at first, but by mid-afternoon it was lovely. 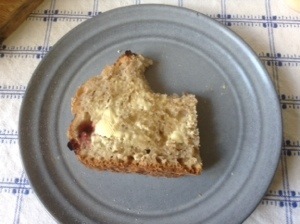 Good flavour though, and a nice shape for sandwiches, so the first loaf was gone within four hours! Le levain: un mélange d’eau et de farine où se développe une culture de levure et de bactérie lactique. Ahhh, magnifique! Now, on to office-related vocabulary in French, necessary but nowhere near as fun as reading French sourdough articles. 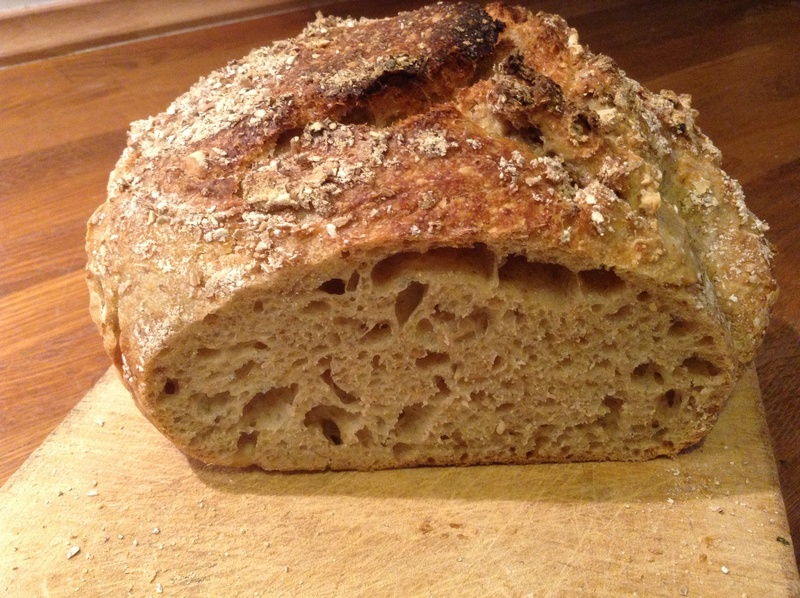 This entry was posted in baking, food and tagged bread, overnight, sourdough on May 27, 2014 by krumkaker.